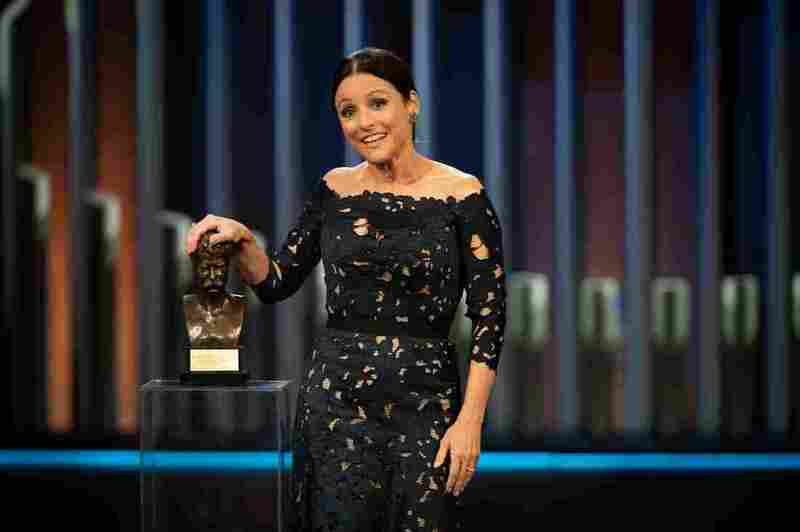 Julia Louis-Dreyfus, Of 'Veep,' 'Seinfeld' Fame, Receives Mark Twain Prize The comic actress was presented with the humor award in a star-studded ceremony at the Kennedy Center in Washington, D.C. on Sunday night. Julia Louis-Dreyfus poses with a bust of Mark Twain, upon receiving the Mark Twain Prize for American Humor at the Kennedy Center in Washington, D.C. The vice president came to the Kennedy Center last night. That would be HBO's Veep: Julia Louis-Dreyfus. "Anyone who knows Julia knows she cherished her high school days — 'boofing' out on the quad, playing 'devil's triangle' with her girlfriends," Fey said. "It's her ability to appear completely effortless and natural on the surface while being a stone cold machine of timing underneath it," Fey said. "Julia is a Terminator robot of comedy." "It's really impressive to see how she's been redefining herself as a comedian and an actor over the decades," he said from the red carpet. Among others honoring her was Veep cast member Tony Hale, who plays her fawning assistant. He said it's been a privilege getting to know her creative process — the way she works with writers, her commitment to finding the right joke. "She consistently handles it with grace and integrity," Hale said. "Except there was that time I couldn't stop laughing during a scene, and she said, 'Tony, you know you're not watching the show. You're in the show.'" It was a brief and not very successful stint. But it's where she met Larry David, who went on to create Seinfeld. "I couldn't get enough of her," Seinfeld said. "I never said or did anything inappropriate. But that whole time — nine years — I was not acting. I couldn't." "So the fact that I have had the opportunity to make people laugh for a living is one of the many blessings that I have received in my life," she said. A telecast of the Kennedy Center's Mark Twain Prize for American Humor airs on PBS next month.